One of the finest neo-gothic church buildings in England, built to the design of Augustus Welby Pugin and opened in 1841. Much of the work is by Hardman & Co. 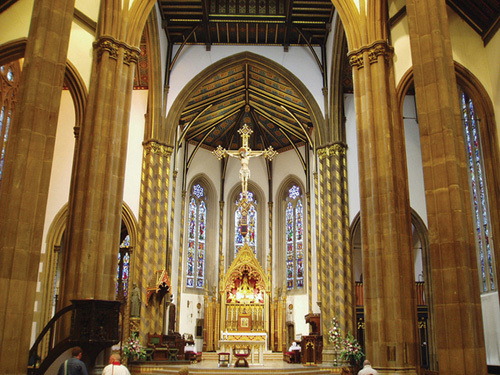 The mother church of the Roman Catholic Archdiocese of Birmingham, it contains some splendid 19th century stained glass made by Hardmans, a 16th century Flemish pulpit, and a late medieval statue of the Virgin Mary, as well as one of the largest new manual organs in the UK, built by Walkers & Co in 1993. Sunday: Mass at 9.00am and High Mass at 11.00am. Train: nearest station: Snow Hill. Bus: buses from city centre to Handsworth (nos. 74, 78 and 79) pass St. Chad's Circus. Car/coach: on the Birmingham inner ring road (the Queensway), just off St. Chad's Circus. Cars: St. Chad's has its own car-park in Shadwell Street. 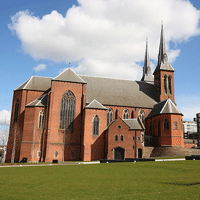 Coaches: set down and pick up only in front of the Cathedral on St. Chad's Queensway. Coach parking at Brewery Street Coach & Lorry Park provides 32 spaces and a welfare building, which contains a rest room with shower and toilet facilities.